Services: Trial Pitting, Cable Percussion Drilling with Rotary Follow on, Lab Testing, Factual Reporting. Project Outline: GTS were asked to undertake a detailed geotechnical ground investigation of a historical radioactive contaminated site. Our data would provide the base information for a specialist cover membrane and rock remediation. A detailed proposal was developed leading to a program that enabled a number of boreholes to be drilled efficiently and safely without risk to the public or our team. 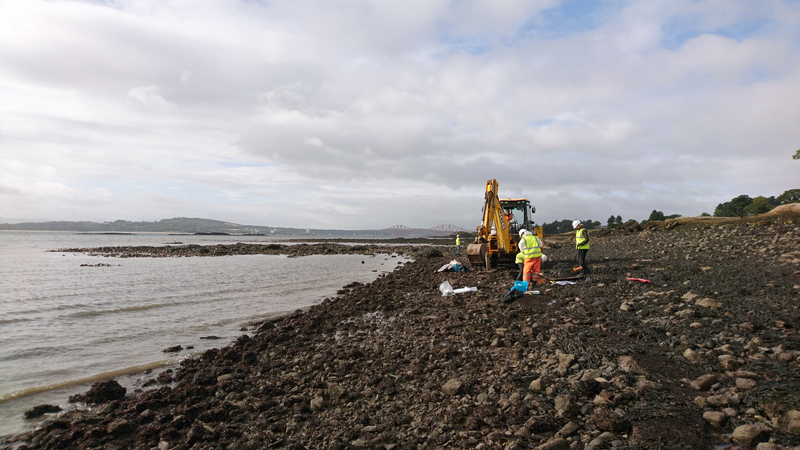 Trial pits were excavated within the foreshore, many below the tide line and therefore accurate pre-planning and knowledge of the area was critical to safely completing these works. The success of the site works was built on the close and open relationship we had with the site owners and the careful management of the public interface.